Lil Boosie, the incarcerated Louisiana rapper, is featured on a new track released that was released in the past week. UPDATE: Lil Boosie has been released from prison on Wednesday night, reports say. He will appear at a press conference hosted by Atlantic Records on Monday. He appears on a track from Big Wayne, who was one of his producers. The track will show up on DJ Smallz’ CIAA 2014 (Southern Smoke Special) mixtape that comes out in a few days. The track was shared via Boosie’s official Twitter account a few days ago. It comes after a family member of Boosie wrote a letter that was critical of his brother, who allegedly stole money from him. Cousin Porche Breaux claims Boosie’s brother, Taquari “TQ” Hatch–who is also is “manager”–was “booking shows in Boosie’s name and collecting cash when he knows good and well his brother is incarcerated. Then the promoters and fans get upset thinking that Boosie is a no-show! Isn’t he hurting the Boosie brand more than anything?” The letter was published by Examiner.com. “His crooked [expletive] didn’t even really have a relationship with his brother! He thought his brother was ignorant and he could out smart him. His dirty [expletive] spent 50k to take his frat brothers on a trip, actually they’ve been on plenty trips….He has been to numerous Saints games, he has 7 nieces and nephews how many trips with them?” Breaux wrote. Breaux then alleged that Hatch didn’t give any of the money to his family. “What about trips with Connie…. why didn’t he take them out of town? Those girls are struggling!! If he cared anything about his family for real he would have been giving the kid’s mom a child support check at the beginning of the month instead avoiding their kids,” it reads. “While everybody’s so worried about District Attorney Hillar Moore ruining Boosie’s life, he needs to be arresting his thieving [brother],” the letter concludes. According to LA Weekly reporter Jeff Weiss–who did interviews with Boosie in prison–the Louisiana-based rapper is going to be released in March. 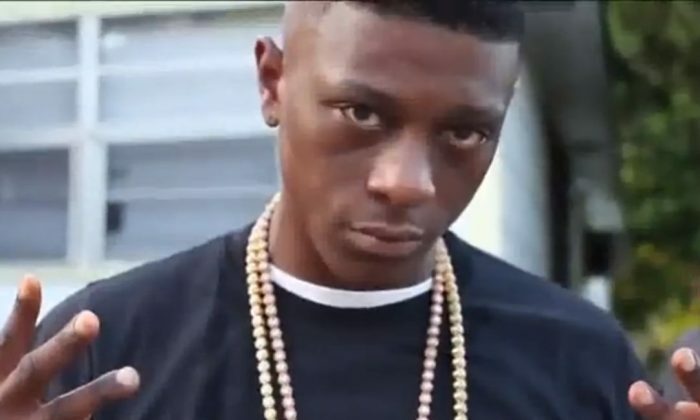 “Just received confirmation that Boosie will not be getting out of jail next week. However, his release is imminent — most likely in March,” he wrote on Twitter.